Microchip announces the mTouch AR1100 Analogue Resistive USB Touch-Screen Controller. The AR1100 controller is a high-performance, USB plug-and-play device that builds on the AR1000 analogue resistive touch-screen controller series and offers advanced calibration capabilities as a USB mouse or single-input digitiser. The new controller is available as a turnkey chip or board product, supporting all 4-, 5- and 8-wire touch screens, with free drivers for most major operating systems. The AR1100 provides a drop-in touch controller for designers to universally support their entire standard resistive-touch portfolio. As the emerging standard for user interfaces, resistive touch provides easy integration and low total system cost as well as finger, glove or stylus inputs for applications such as medical devices, industrial controls, handwriting or signature capture, and other touch-input mechanisms. Additionally, USB communication is the industry standard for attaching peripherals to a computer. The AR1100 touch-screen controller combines these two standards into a single-chip solution for low-cost, high-performance resistive touch with USB plug and play. The controller also features advanced calibration options for alignment and linearisation, enabling superior accuracy for 4-, 5- and 8-wire touch screens, as well as highly accurate button pressing for critical applications with tight board spacing. With free drivers for most major operating systems, the AR1100 enables designers to quickly create low-risk touch interface solutions. 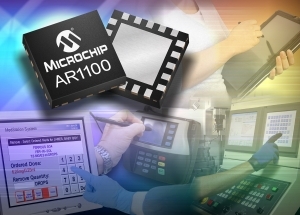 In addition to the AR1100 controller, Microchip also announces enhancements to its AR1000 analogue resistive touch-screen controllers, with new high-volume market pricing, a full suite of drivers, including those for the Windows® CE, Linux and Android operating systems, and a new minimum operating voltage down to 2.0 V. The AR1000 is a turnkey analogue resistive touch controller that targets low-cost embedded applications using I2C™, SPI or UART communications.